Mayonnaise is rich and healthy sauce used for different purposes. It is generally used as spread to create a base. This base is used on pizza, sandwich and so on. It is otherwise used for dressing salad, pasta and as a dip for French fries and seafoods. Mayonnaise is prepared with egg yolk in few easy steps. One can make this sauce at home and can preserve it for several months. First, of all egg, yolk is whipped well and then few drops of olive oil and lemon juice are added to it. Vinegar can also be used instead of lemon juice. Another method includes the usage of flour, milk butter and vinegar or lemon juice. This recipe is generally followed by vegetarians. Mayonnaise, as a base can be used with different sauces. For an example, Mixture of mayonnaise, tomato sauce and mustard sauce results into condiment. When, mixed with tomato ketchup it makes fry sauce, a new form of yummy sauce. Tartar sauce can be made with the mayonnaise, carper, and parsley, which tastes great with seafoods. Try other dips with the combination of ground pepper, green onion, pickle relish and other ingredients to make something delicious out of it. Number of recipes can be made out of the combination of mayonnaise and other ingredients, which tastes well with chicken wing, bread loafs, salads, fish and other seafoods. One can also browse these easy recipes online to try something new and tasty. Unhealthiness of mayonnaise is just a misconception. People generally think so but research has proven it wrong. 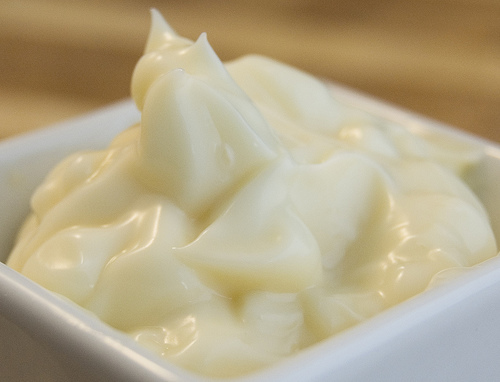 Mayonnaise actually has numerous health benefits. Mayonnaise sauce contains rich omega-3 fatty acids and vitamin E, which are good for human health. Mayonnaise is a good source of vitamin E that prevents strokes. It also contains Omega-3 acid, which is good for heart. Benefits of Mayonnaise on postmenopausal women have also been proven. Lungs are the most important organ of human body that eliminates C02 from blood and keeps you healthy. Mayonnaise helps in good functioning of lungs as well. It plays a vital role in keeping the lung vibrant and healthy. Mayonnaise can also be applied directly on face to get baby soft and radiant skin. It nourishes the skin and helps in looking fresh and glowing. Mayonnaise is considered as the best treatment for dull and fizzy hair. It works as conditioner; it smoothed hair and leaves hair silky and softer. Take a little amount of mayonnaise and apply it from the root to tip of the hair. Leave it for an hour and wash your hair to get a shiny look. It is also used as a treatment for lice. Sunburn and chapped skin: Mayonnaise is also used to treat sunburn, apply it on the affected area to get the soothing effect. Another good benefit of mayonnaise is easy removal of dead cell or skin. Apply it on elbow, feet chapped lips and on flaky skin to nourish the affected area and make your skin softer. However, calories in mayonnaise are very high, which may lead to weight gain. Therefore, use it in limited amount and enjoy its taste and benefits. There are large numbers of sauce suppliers that manufacture and supply different verities of sauce at wholesale price. Sauces that they deal in are tomato sauce, sweet onion sauce, mustard sauce, chili sauce, veloute sauce, white sauce, brown sauce, mayonnaise sauce and lot more. The way I am rushing to buy bread now ehn lol. I have always loved mayonnaise and I would be eating more of it now. Super tasty food! This is great eyes opener… Thanks a million for such enlightenment. it is really an informative post as I also do not know the benefits of mayonnaise. Thanks for sharing it.